So I really like to decorate for holidays but sometimes purchasing already made items can get pricey, especially if you want them during the season and don’t want to wait until the day-after sales, which is my favorite time to buy any holiday decor. ðŸ™‚ You can make handmade items for a fraction of the cost of store-bought items (especially if you are a craft supply hoarder like me), have the pleasure of making it, choose the colors, sizes, etc and then feel the accomplishment with your finished project! Last week i got my craft on big time and made several items in the above picture that i am happy to be able to share this morning on fox channel 4’s kansas city morning show and here with you! 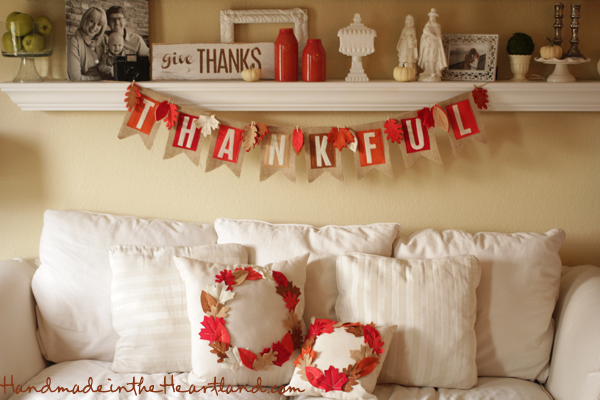 Keep reading for instructions on how to make the thankful banner, leaf wreath pillow & give thanks sign pictured above! Felt- i used one light color for the letters, and 5 other colors for the backgrounds of each letter. 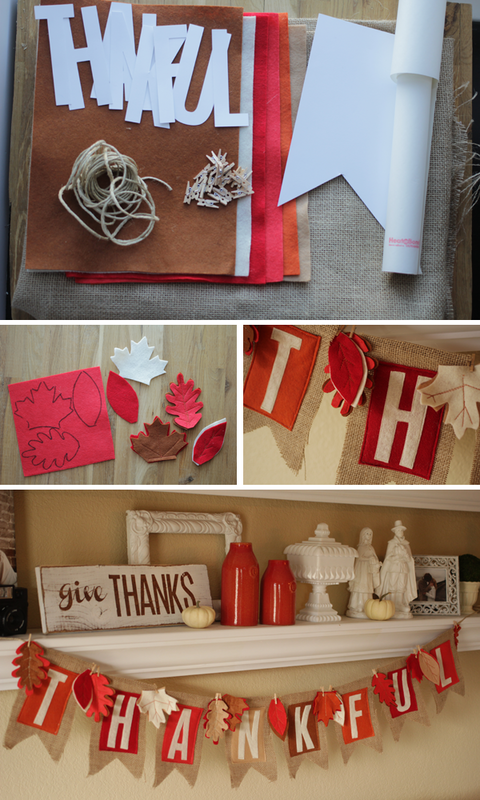 Â The 9×12 pieces that you can buy at crafts stores for 25 cents are perfect for this project. 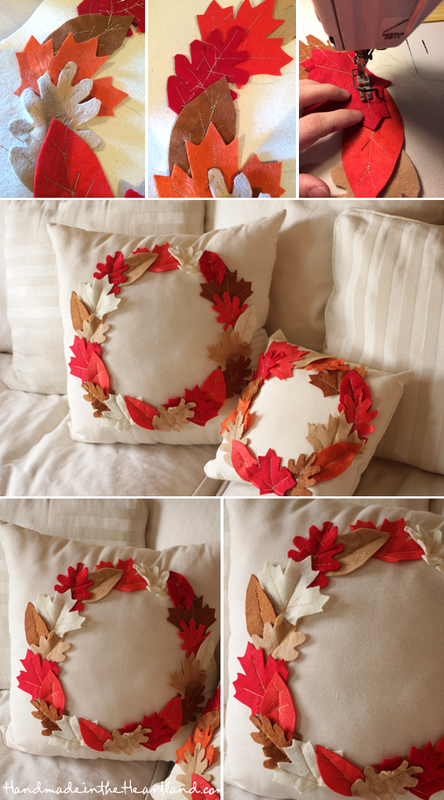 Â You only need one of each piece if you are only making the banner, if you would like to make the leaves to attach to the banner and/or the leaf pillow get 2-3 of each color. 1. Cut out your patterns. Â I used my silhouette to cut out the letters but you can just as easily print them out and cut them out with scissors. You can download my letters for free HERE and HERE. Â I like to use card stock for my patterns so they are more durable. Â The leaf shapes that I used are from THIS site. Â Cut out 8 pieces of burlap that are 5 1/2″ by 16″, fold each piece in half lengthwise and then cut a triangle out of the bottom, the top of my triangle was 2.5″ up from the bottom of the pennant. Â You want the top to be the folded part so that you can just slide the twine into the fold. 2. Cut out your leaves, instead of cutting around the paper patterns i found it easier to draw around the pattern on the felt with a sharpie and then sit and watch tv and cut them all out :). Â Cut out the background rectangles for the letters- using a ruler draw 3 1/2″ x 5″ rectangles- you will need 8. Â Before you cut out your letters attach heat bond to the back of the felt per the package instructions and then cut out your letters. 3. Attach the letters to the felt rectangles by ironing them on using the heat bond side. Â This makes it so much easier to do the decorative stitching around the edges of each letter, the letter is now stuck on so it wont move while your sewing. Â So next sew the letters onto the backing- i stayed about 1/8″ in from the edge, i used metallic gold thread and loved the way it looked. Â While your sitting at your machine go ahead and sew the details on the leaves, I did it in the metallic thread as well. Â You can see in the photos below what i mean by the “details”, but basically you just make the veins of the leaf- i did it totally free hand by just going down the center of each leaf and backstitch and pivoting my needle to go in different directions. 4. 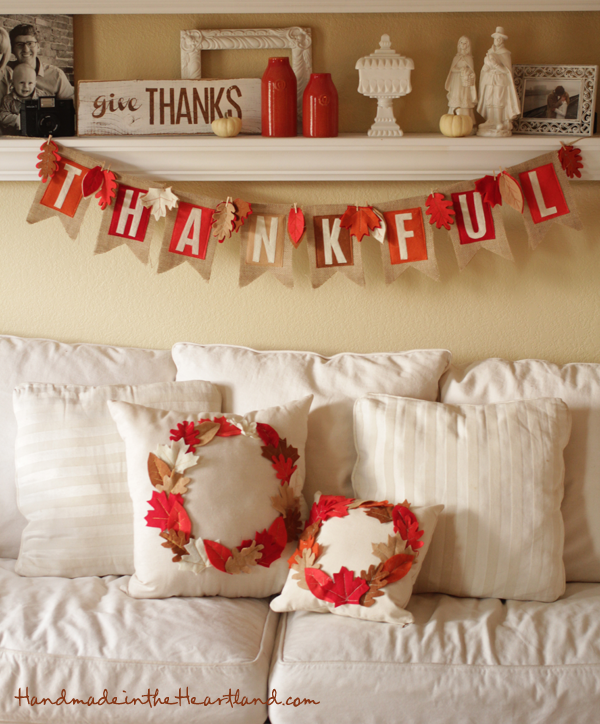 Pin your rectangles with the letters to the burlap pennant, I placed them 1″ from the top. Â Sew them on about 1/4″ in from the sides of the felt through both layers of burlap. Â After sewing the rectangle on you will then have a little pocket to put the twine through. 1. Cut out your felt leaves, i used THIS template. Â Then sew the details on the leaves, i did it in metallic thread. Â You can see in the photos below what i mean by the “details”, but basically you just make the veins of the leaf- i did it totally free hand by just going down the center of each leaf and backstitch and pivoting my needle to go in different directions. 2. Cut out your background fabric, i made a small pillow that was 14×14″ and a large one that was 22×22″. Â You will need two pieces, a front and back. 3. Â Using a compass draw a circle on one of the linen pieces, make sure the circle is at least 3″ away from the sides. Then take your leaves and arrange them around the circle. Â I alternated color and shape so that it was in somewhat of a pattern. Â Once you have an arrangement you like pin them down. 4. Â Sew the leaves onto the background fabric. Â I used the same metallic thread and sewed each leaf on by sewing on the center of each leaf directly on top of the stitches that were already there, so there is not additional visual stitching on the pillow. 5. Sew on your invisible zipper on to the bottom seam and then with right sides facing together sew all around the pillow. Â Make sure your zipper is open or you wont be able to turn it right side out :). Turn it right side out, fill with pillowing filling and zip her up! Enjoy! 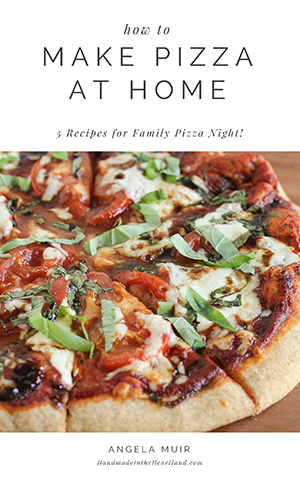 I love this project and how customizable it is to any holiday or saying you might want in your home. Â Check back because i will be putting up a more in depth photo oriented tutorial in the next few weeks. 1. Stain your board with your preferred stain color and let dry. Â I always let it dry for at least 8 hours, if possible 24. 2. Place your vinyl lettering onto the board- i like to place a strip of painters tape where i want the bottom of my letters to be so that they are strait. Then i take off the painters tape before i paint over the letters. 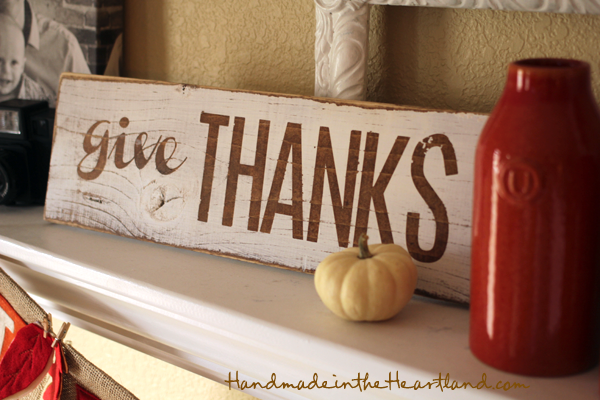 If you have a silhouette cutter you can download my give thanks file HERE. 3. Â Make sure the letters are firmly on the board and then paint the board white, painting over the letters. Â Let dry. 4. Â Remove the vinyl letters and reveal your beautiful wood stain ones. Â Now take a sander to your board. Â i sanded all the ends of the board so they are more rounded and not sharp, i sanded over the front of the board to reveal some of the woodgrain and give it a rustic weathered look. Other than the drying times this is a really fast project and i love how you could do anything from give thanks to merry christmas, to Welcome.